Cefn Cilgwyn, is situated on a quiet country road, midway between the village of Llangadog and the ancient drover's and market town of Llandovery (3 miles to each) . 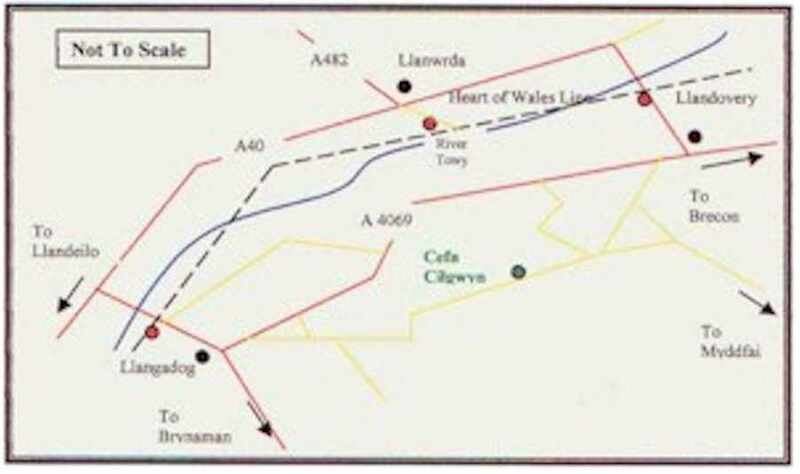 By Train: There is a train station at Llangadog and Llandovery on the Heart of Wales line. We will be pleased to arrange transport from and to, either station on your arrival and departure, by car or horse drawn carriage (there is a charge for the horse drawn carriage). From Llangadog- take the A4069 towards Llandovery for about 100 yards. Take the first turning right (signpost Myddfai). Continue on this road for 3 miles until you reach the sign for Cilgwyn Manor on your left hand side. Turn down this drive, at the bottom you will see a Victorian lampost on your left. Follow the track on the RIGHT hand side of the lampost and it will take you up to the yard of Cefn Cilgwyn. From Llandovery- take the A4069 towards Llangadog. After one mile take the first turning left (signpost Myddfai). Follow the road up the hill and down again. At the bottom of the hill bear right. Continue for a further 1/2 mile until you reach the sign for Cilgwyn Manor on your right hand side. Turn down this drive, at the bottom you will see a Victorian lampost on your left. Follow the track on the RIGHT hand side of the lampost and it will take you up to the yard of Cefn Cilgwyn.